Heroes, Heroines, and History: 1918 Flu Pandemic And Book Giveaway ends 2/14! 1918 Flu Pandemic And Book Giveaway ends 2/14! 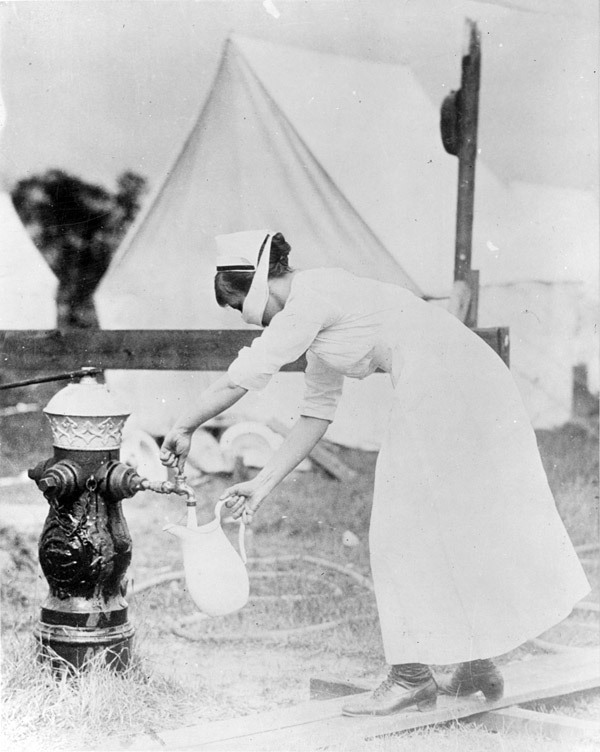 The 1918 flu pandemic officially began in January of 1918. This was the first of two pandemics involving the now familiar H1N1 influenza virus. 500 million people all over the world were infected by this virus including the Pacific islands and the Arctic. To give you an idea what the 1918's were like, let me give you some highlights about the time. America was in a world war, but despite that, they had more leisure time than their previous generation. 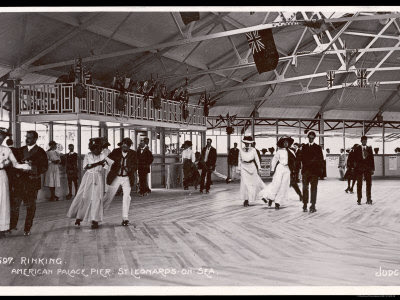 They flocked to dance halls, pool halls, movies, roller skating rinks, and saloons. 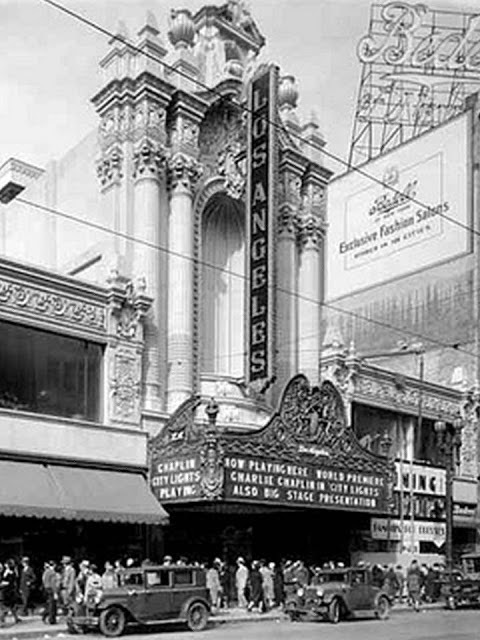 Fans swarmed into the nation’s many movie theaters. America’s love affair with Hollywood celebrities was already a permanent part of the culture. From 1896 to 1918 the number of passengers traveling by rail tripled. Only a few Americans could afford cars. Henry Ford and his new innovations was about to change all that. The use of telephones up to 1918 was extremely expensive. The phone companies were working hard to expand their limited lines to much of the country where service was unavailable. Newspapers were the form of 'getting the news out'. Even small towns often had more than one newspaper. Breaking news that needed to get out was done so by printing another newspaper. These papers were called 'extra'. So now you know why we hear, "Extra, extra, read all about it!" The lad yelling that was letting people know there was breaking news. Okay now that you have some 1918 background, lets get back to the flu epidemic. With entertainment big business and all those people getting together, it became a huge concern for public health experts. At the height of the epidemic government officials rushed in and closed many of these entertainment places, fearing the spread of the influenza virus. 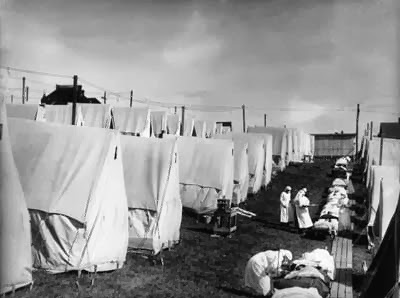 Some of the earliest victims of the flu were the American soldiers stationed here in the United States. As the epidemic spread the disease wasn't partial to US soil and quickly spread to military hospitals not only here but abroad. By November of 1918 the whole world was affected by the growing pandemic. 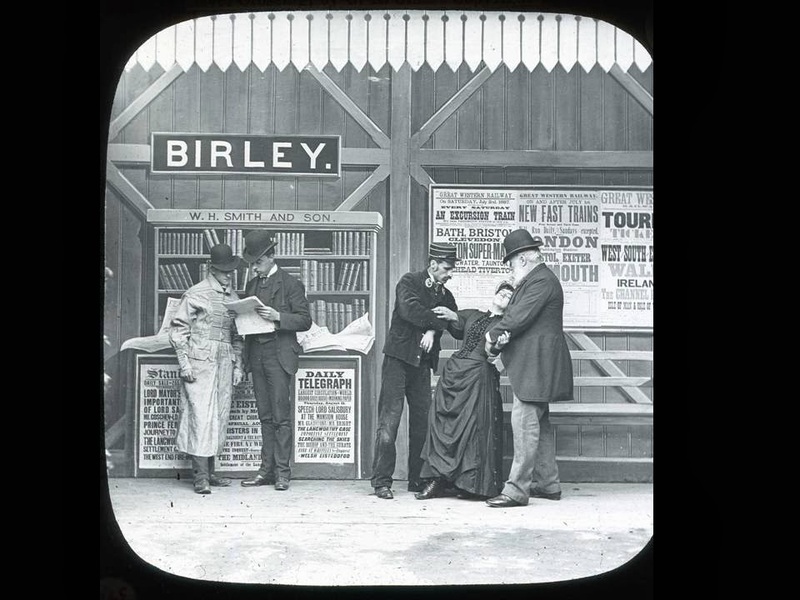 The rail systems being so popular became an easy channel for the spread of the influenza virus. During the epidemic, cities became concerned about how easily the virus spread, causing some cities to limit and even close their transportation systems. 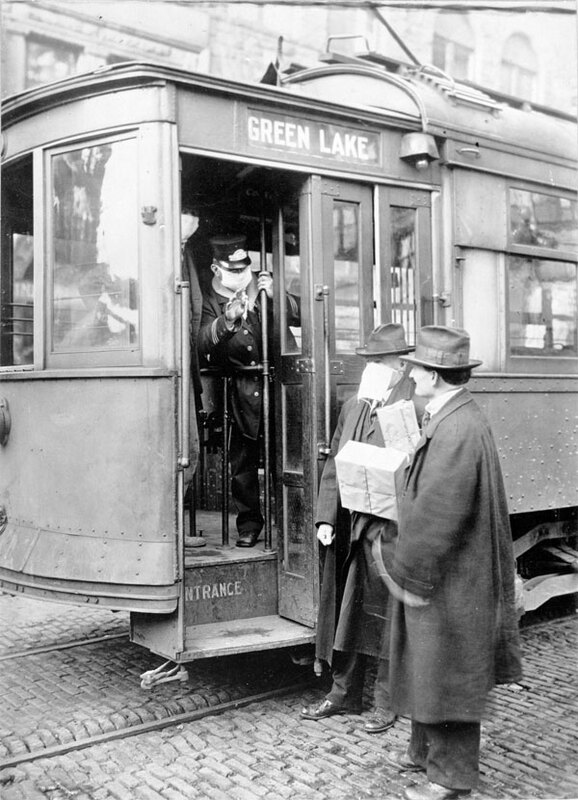 Many cities that remained opened had people wearing masks to reduce the risk of infection. 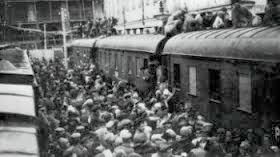 Between nine and sixteen million people died during the war. But the influenza pandemic would take a staggering fifty million lives, which at the time was approximately one fifth of the world's population. These high mortality rates made this one of the deadliest natural disasters in history. The 1918 flu killed more people than all the wars of the 20th century combined. So who died in this epidemic? You might think the young and old. If you guessed that you'd be wrong. The 1918 disproportionately killed the healthy young adults. The reason wasn't known why them, but in modern research, researchers have discovered the virus killed through an overreaction of it's immune system. The stronger the immune system, the stronger the reaction. So the young adult body was ravaged, where a child or middle-aged adult had a milder reaction. Death came quickly. Victims had such a violent immune response that there are stories where people died within hours of showing symptoms of the flu. Their lungs would fill with fluid and they would suffocate. Doctors were helpless to stop the toll that the influenza took on the young adults. On a personal note, my grandmother was one year old in 1918. Her Aunt Icey (her mother's sister) died of influenza. 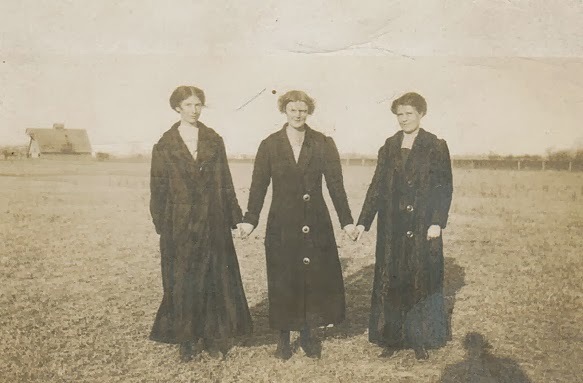 Ten days later my grandmother's mother, Basha Bay Veatch Davis contacted the flu and died, leaving my grandmother an orphan. The two sisters, though they didn't live near each other at the time of their deaths, were best friends. They wrote many letters back and forth to each other, some of which we still have today. My great-grandmother, Basha Bay left one child, Delitha Vivian Gilbert to be raised by her grandmother Mahalia. Icey May had lost her only child and at her death left her husband childless. My husband's father was a young man in 1918. He told us about the flu epidemic. The memory embedded in his mind was looking out the window and seeing them stack bodies like cords of wood because the morgues couldn't keep up with them. Leave a comment to be entered in drawing. Your choice of 1 of 6 books. Don't forget to leave your email address. She and her husband have four children. They live in upstate South Carolina with their family. She spent thirteen years coaching cheerleading and trying to make a difference in young girls’ lives. Debbie Lynne has raised Shetland sheepdogs for eighteen years and occasionally shows them. In her spare time, she sews, paints, makes jewelry, camps (in a fifth wheel) and enjoys the grandbabies. Being a nurse and in light of this year's flue epidemic, you chose a very interesting research post! I was also interested in your Grandmother's part in this epidemic. I would love to win one of those books- either by Mary Ellis or Anne Mateer. Thanks for your post. Thanks for coming by, Sharon. I often think about Bash and Icy's deaths around this time of the year. What a horrible thing for a mother to lose two of her children. They said my grandmother hadn't been feeling well and they feared she had contacted the flu. She very well may have, but as we know now her immune system was young and so her body didn't have the violent response. Good luck on the drawing! I have read books about the flu epidemic and its so sad. I am not sure how bad it was in Australia need to go look it up again. We had a really bad flu 2012 the nursing home mum was in had about 14 deaths in a few weeks including my mother. I would have been so hard back then when they didn't really know how to deal with the epidemic where as know they at least have more of an idea. I'm sorry about your mother, Jenny. That is so hard to lose someone so close to you. I know the 1918 flu was world wide. Just think if they'd have had travel then like we do today. Good Luck, Jenny! Thank you, Angela! It was a very interesting post to research. So many lives were touched by that flu. And even today with all our technology it would be hard for doctors to combat such a beast. Good luck! Wow, those numbers are staggering. I don't know that I ever heard it attacked healthy adults the most. Very interesting info! Interesting and scary! To think our own immune system can work against us. Thaks for coming by and good luck! Be sure to leave me your email addy in case you win. Great post, Debbie Lynn! One of my grandmother's brothers and his entire family---wife and kids---all died of the flu in 1918, the same year my mom was born. Oh my, Ramona! That is so sad! The ration of adults to children was really in the children's favor. How sad. What an interesting post, Debbie Lynne. I loved learning more about Basha and Icey, as I've heard about them before ;) and I had no idea a healthy immune system could be one's undoing. Certainly goes against the "survival of the fittest" way of thinking. In fact, if it's true that the strongest people died, it would be an exact opposite of that model! Thanks for sharing. It is true, Linore. I can share the links with you. The immune system had such a violent response to the virus that it over compensated and they drowned in their own fluids. That is why so many of the young healthy adults died. I'm glad you remembered Basha and Icey! Hi Debbie, what an interesting post. The sheer number of deaths is mind-numbing, I read somewhere that even today's flu strains are more dangerous to young people because of overactive immune systems. Sometimes it pays to be old. Thanks for coming by, Linda. I know the numbers of death were staggering. It is hard to wrap one's mind around the numbers. Good luck in the drawing! Thanks, Eliza! Thanks for coming by. Good luck! Thanks for sharing, Maxie. Yes, 500 million contacted the flu and 50 million of those died. You'd think that with all of our medicine and technology we could have better results with the flu. But there are some things that only God can stop. Thanks for coming by. I know those pictures really make it real. Makes you see they were real people with real lives. So sad. This info is very interesting but yet so sad. I certainly never would have imagined that the healthiest people were the ones who died of this influenza. Thanks for coming by Pam. It is so sad and scary that it could happen again. Good luck in the drawing. 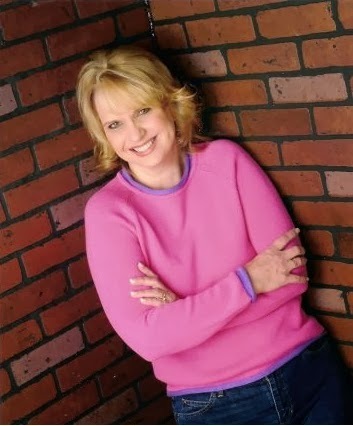 Hi Debbie Lynne! What a sobering thought that more people died of the flu in one year than those who died in all the wars in an entire century!! Holy cow, that's some flu bug! I didn't think the ages seemed to mesh between your great-grandmother and your husband. Sounds to me like somebody's cradle was robbed somewhere along the line! ;) Thanks for the very real & scary post! Oh my goodness. That was such a terrible time. And yes, you are right, there was a cradle robbed. Wow so sad but so interesting to see where we are today. Thanks for informing us about history! Thanks for coming by, Michelle. It is very interesting and so very sad.Good luck in the drawing. Thank you for this insight into history. 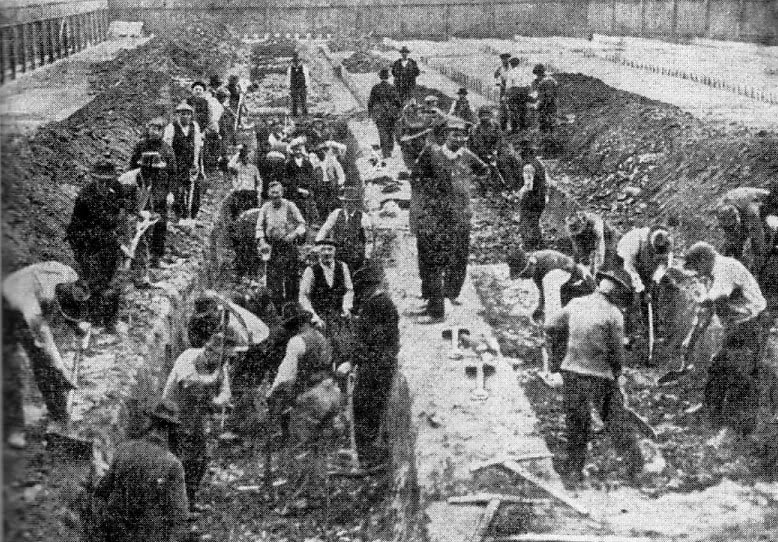 It is fascinating to learn about how people lived in history, even if it is something terrible. I agree, Susan. And hopefully we can learn from the history we know. It had to have been a terrible time for people. What a very interesting post. Thank you for sharing this history. I would love to hear more about your history! Thank you, Melanie! I might just have to do a post on that someday. It is rather interesting. This was such an informative post. I had, of course, heard about this epidemic from years past and it was even part of Downton Abbey during one season! But to read how quickly it affected some people and that it was the healthy ones that succumbed is scary! Thanks for the chance to win a book. I really hope for the chance to win A Little Bit of Charm by Mary Ellis. I haven't watched Downton Abbey but have been dying to see it. Just can't seem to find the time to sit down and watch TV. How fast many died after contacted makes those movies about the spread of some unknown disease seem much more possible. Very scary! Good luck in the drawing, Brittany. A very informative post! What a scary event to go through. Yes, it was, Merry. May God be merciful and we never have to face it again. I love this blog with all the history! Thank You to those who contribute. I would love....Before the Season Ends OR A Home For My Heart OR WHISPERS FROM THE SHADOWS! I'm so glad you are enjoying 'The Society'! Good luck in the drawing. 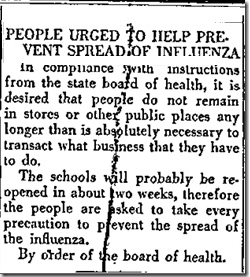 I've always been especially aware of the influenza epidemic in 1918. My paternal grandfather lost his 18 yr. old brother. My maternal grandfather lost his 1st wife. His youngest son who was four almost died. As a last resort, the Doctor took two of his ribs out. Oh my, Martha. I wonder if that really did help. I can't imagine how it would have. Thank you for sharing. So many families were hit by this epidemic. Very few escaped unscathed. This post was very interesting and so sad so many lost their lives. I am very grateful for the medicines and medical help we have today. I learned a great deal from this post thank you. I would like A home For My Heart or any others all great authors. Thanks for coming by, Jackie. I'm glad you were able to glean some history facts from my post. Good luck in the drawing. Being aware of history is vital to our future. I'm so thankful that so many people kept accurate accounts of history. Thanks for coming by and good luck!